The three Republicans who represent Iowa in the U.S. House have voted to elect Wisconsin Congressman Paul Ryan as the new speaker of the House. Rookie Congressman Rod Blum of Dubuque and veteran Congressman Steve King of Kiron were among the few to vote against Speaker John Boehner in January, but today both King and Blum voted for “fellow Midwesterner” Ryan. 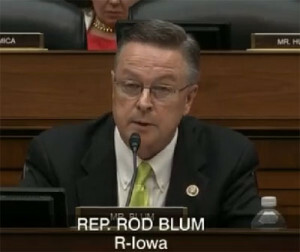 Blum issued a written statement, saying he believes Ryan will improve House operations in a positive way. King had been campaigning for over a year to get a Florida congressman elected speaker, but he wound up voting for Ryan. King tweeted this morning that he will “work this new beginning hard” to get the voice of the people heard in congress. King also said we need a new president and he ended the tweet with an exclamation point. Congressman David Young, a Republican from Van Meter who is also in his first year in congress, voted for Ryan, too.